6,000 men in the United Kingdom were imprisoned during the First World War for refusing to fight. The majority of these ‘conscientious objectors’ (COs) were ordered into the fighting services or forced to join the Non-Combatant Corps (NCC), but 1,500 refused to work in any way that would help the war effort and they remained in prison. Life in prison was harsh: conditions were poor and prisoners could be subject to punishment. Additionally, COs could not always count on the moral support of friends and family – many were shunned by their communities for taking the unpopular stand against war. In light of these factors, in order to cope with prison life friendships among prisoners were vitally important. Despite coming from different backgrounds (some COs held strong pacifist beliefs, some held strong religious beliefs about the immorality of war whilst some objected to war on political grounds but were not religious), their opposition to war and fighting united the men and the friendships they developed helped them cope with life in prison. Women first heard that an ‘Embrace the Base’ protest was planned because of a chain letter (so different from today when an e-mail or Facebook message can reach thousands instantly). An unsigned letter advertising the Embrace the Base action was first sent to 1,000 women, who were each asked to copy it and post it to ten friends. This chain letter worked well: 30,000 women got the message and arrived to protest against nuclear weapons at Greenham Common air base on 12 December 1982. 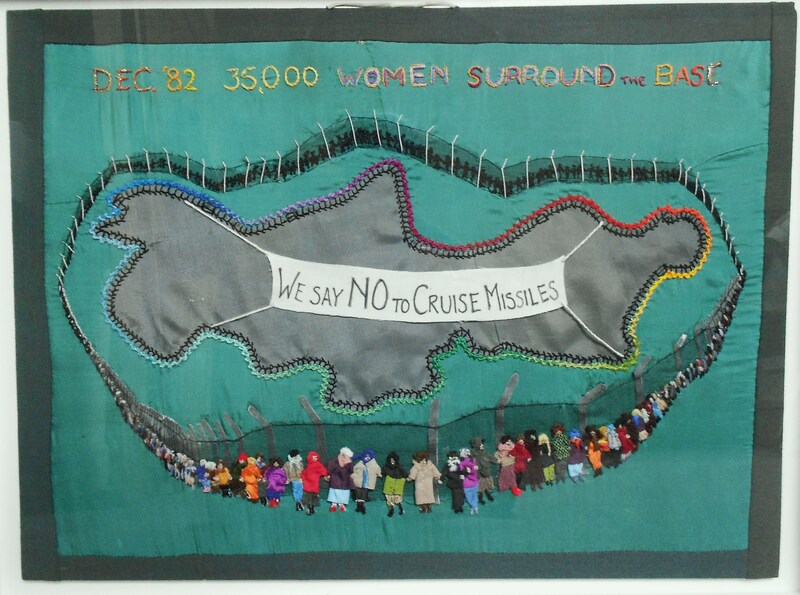 Their protest did not stop cruise missiles from being based at Greenham Common but the women did not let that stop them – they stayed and maintained a presence at Greenham for 19 years and the base eventually closed. Appliqué picture of the 'Embrace the Base' protest by Daphne Morgan. Peace campaigners speak out for issues that are important to them and try to bring about change without using violence. 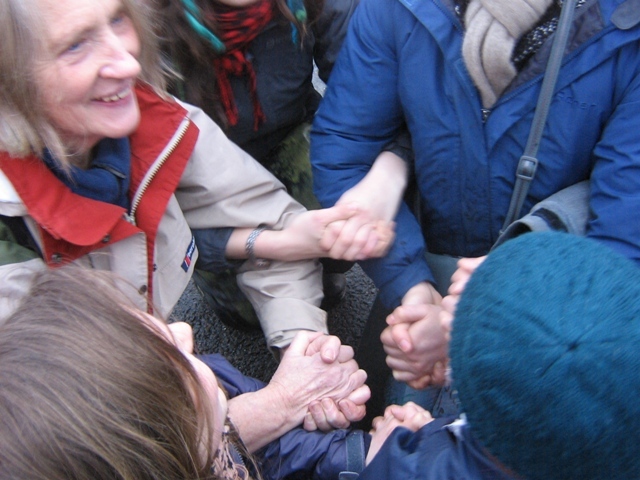 Although peace campaigners use traditional ways of speaking out such as displaying posters and banners and signing petitions, some peace activists also choose to use ‘nonviolent direct action’ techniques to confront and try to stop what they believe is wrong. Their goal is to prevent a political organisation or other organisation from carrying out a practice which they object to. Campaigners block an entrance to Aldermason AWE by sitting with their hands glued together, making it difficult for the police to move them. Examples of direct action include blocking roads or building entrances, breaking into and occupying government or other property, rallies and sit-ins, to name just a few. People protesting against nuclear weapons, for example, sometimes use direct action techniques. Such techniques were used particularly during the 1980s. 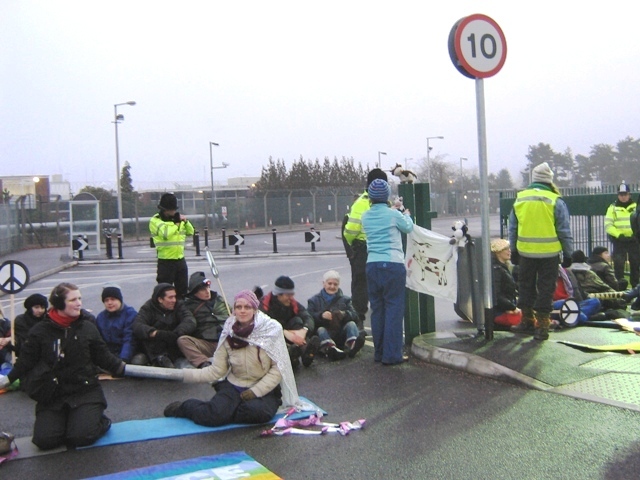 In the United Kingdom (UK) activists have broken into and occupied United States air bases and blocked roads to prevent military vehicles from going onto bases. In the UK groups also set up semi-permanent “peace camps” outside air bases such as Molesworth and Greenham Common. Some who use direct action techniques have been arrested for doing so. Do you think people should have the right to protest using nonviolent direct action techniques? Thalia Campbell made this banner as a reminder that there are things that we can to do if we want to build a more peaceful world. Thalia has been active in the peace movement throughout her life and has used banners as a way to campaign and spread a message. In the 1980s, before the internet existed, Thalia said that campaigners had to use banners, postcards, posters and word of mouth to get across their message. This banner was made in Autumn 1981 soon after the women arrived at the United States Air Force (USAF) Base at Greenham Common to protest against missiles that were being sited there. The poppies are red to show that the women who were protesting shared and respected Remembrance, but there are also other colours (of the Cooperative and Green movements) to show that more is needed to build to a better world. 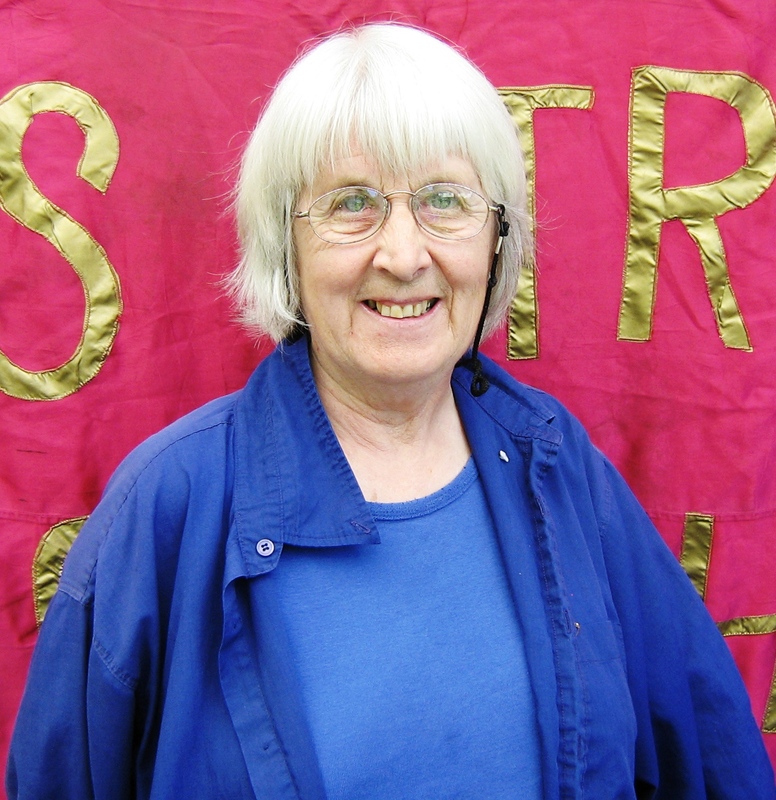 Thalia’s banners have been displayed during anti-nuclear protests at Greenham Common Womens Peace Camp in the 1980s, during the 1984 Miners’ Strike, the Poll Tax Riots of 1990, in town halls, in places of worship and many other places. Her banners have travelled extensively in the United Kingdom and have even been overseas to Europe and the United States of America. The term ‘conscientious objector’, or ‘CO’ for short, was first used during the First World War to describe those who refused to fight in the armed forces on moral grounds. In 1916, conscription was introduced, meaning that all young men were forced to fight. However, 16,000 men claimed exemption from military service. Some felt that fighting went against their religion, others simply held all life sacred or saw the war as purely an upper class quarrel. Those applying for CO status had to undergo a court trial. Very few COs were granted full exemption by the tribunals judging their cases. Many were willing to join the war effort in non-combatant roles such as ambulance work, however, about 6,000 were imprisoned for refusing to help in any way. The majority of these were employed by the government to grow food, but 1,500 refused even to compromise that much and remained in prison. 24 men died due to the treatment which they received. The remaining COs were not released until 1919 and were not allowed to vote until 1929. The United Nations Commission on Human Rights did not recognise the right to conscientious objection until 1987. There are still many places where it is not acknowledged today. 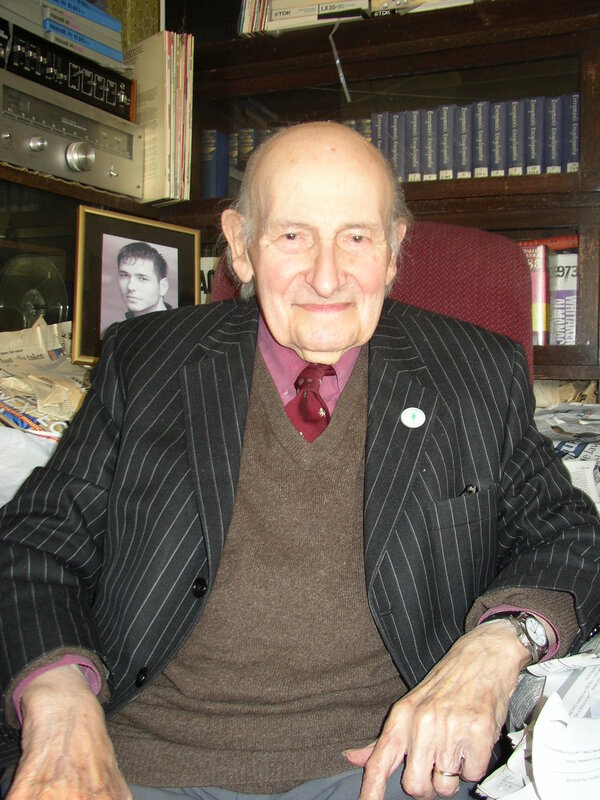 Ron Mallone (1916-2009) decided to become a pacifist, or someone who is against war and the use of violence, at the age of 15 after reading the Sermon on the Mount in the Bible, which he said changed the rest of his life. Ron worked as a schoolteacher and also found a way to combine his interest in politics and his pacifist beliefs by getting involved with anti-war groups. During the 1930s he joined a number of anti-war organisations, including the League of Nations Union (a forerunner of the United Nations Association), the Anglican Pacifist Fellowship and the movement to demand a peace ballot. Ron was an ‘absolute pacifist’. An absolute pacifist believes that it is never right to kill a person, take part in war, or use violence even if defending oneself or someone else from attack. As an absolute pacifist Ron opposed even the building of air raid shelters because he felt that they contributed towards the support of war in some way. When war came in 1939, Ron registered as a conscientious objector (CO). In 1940 he had to appear in front of a Conscientious Objection Tribunal which decided whether he would have to do alternative war service or whether he would be exempted from having to do so. Ron’s Tribunal members included a military man, a local MP and a trade unionist. Ron asked to present his own case instead of having someone speak for him. Ron must have presented his case well because he became the first absolute pacifist to gain unconditional exemption from war service in his district! This section of the museum refers to the idea of Remembrance – that is remembering those who have died in wars throughout history. The idea of remembrance grew out of the First World War as something had to be done to remember the millions of soldiers who had died. The exhibits in this area are asking the question of whether or not remembrance is enough? Is it enough to remember those who died or could we do more? How can we help prevent so many soldiers dying in the future?